The Department for Transport (DfT) has announced £1.5m funding for a dedicated safety board for trams across the UK. 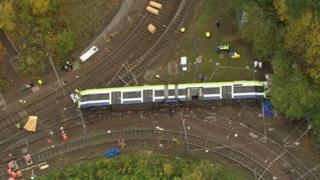 The new body was one of the recommendations by the Rail Accident Investigation Branch (RAIB) after the 2016 Croydon tram crash. Seven people were killed and another 62 were injured in the derailment. Croydon MP Sarah Jones expressed "frustrations" at the government's progress since the crash. The new Light Rail Safety Standards Board (LRSSB) will look to make improvements to tram networks. Currently, there are eight light rail networks in the UK including Blackpool, London, Manchester, Nottingham and Sheffield. A 174-page report into the Croydon crash by RAIB was published last December and made 15 recommendations to improve tram safety. These included stronger windows and doors on trams, a better understanding of the risk of trams and the creation of a dedicated safety body for UK tramways. Ms Jones had campaigned for the government to fund the LRSSB, which was approved by Transport Minister Jesse Norman on 7 February. But the Labour MP said she did not want the money to be a "one-off cash injection". She said: "I want to see sustained investment and oversight of our trams so that a tragedy never happens again - not just in Croydon but anywhere in the UK." In response a spokesman for the DfT said: "We are committed to supporting the light rail industry to continually improve safety for the travelling public."